OnBoarding Officers, in association with Education Learning UK, TQUK, Officers’ Association, The Army & Navy Club, Clarke Willmott, British Forces Resettlement Service, Central Hall Westminster and KUDOS, will be hosting two programme taster events on 5 and 6 June with workshops on Spotting the Signs of Financial Misadventures. 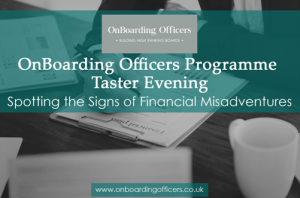 OnBoarding Officers is hosting two free evening events, in Manchester and London, to give interested ex-military officers and SNCOs an opportunity to have a mini demo of one of the programme’s modules. Jo Haigh, Sunday Times and IoD NE & Yorkshire NED of the Year, will provide a short workshop on Spotting the Signs of Financial Misadventures. Offering a toolbox of takeaways, attendees will have an intimate insight into just what the full OnBoarding Officers Programme has to offer, as well as having an opportunity to network and meet the programme tutors, Super NEDs and Ambassadors. We have two events available, dependant on preferred location. The London event is being held in central London and will start at 18:00 on Wednesday 5 of June and will finish around 20:00. The Manchester event is being held in central Manchester and will start at 18:00 on Thursday 6 June and will finish around 20:00. An exclusive 25% discount offer is available to the attendees that book their place onto the October and November cohorts by the end of June.